Arnold Schwarzenegger yesterday stood down as governor of California after 7 years in the job and while the state goes through its most difficult financial crisis in history. Democrat Jerry Brown has taken his place. The important thing with my job that I’ve had for the last seven years is, you have to have passion … You can’t be afraid…You have to recognize very quickly that political risk-taking is not political suicide. The state of California (8th largest economy in the world) is currently going through one of the worse financial hardships the state has ever experienced, with debts in the tens of billions and the majority of state bills being paid with IOU’s its difficult to see where the future of California is headed. Arnie on the other hand though seems to have many options now open to him post-governator. He holds an economics degree, he’s been a prominent figure in health with his bodybuilding career and of course his film career. He also has a lot going on the business world and now with his recent stint in politics he sure does have a lot open to him. People who’ve followed down the political path after retirement seem to either write an autobiography, start giving a lot of speeches or sit around doing nothing. I doubt he’ll decide to do the latter, but I can’t really see Arnie write a book either. I think the most obvious thing he’ll end up doing is either get back into starring in movies or take some time behind the camera and direct/produce a few things. Arnie has always done film in his time in Hollywood, it would be interesting to see him in a TV show, but he is such a huge star I doubt that will happen. 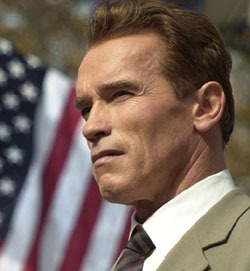 Now that Arnie has finished his political carreer what do you think he’ll do next? ← Like NBA 2K11? Check Out Chris Smoove!